ATLANTA (AP) — The Atlanta Falcons must prepare for two quarterbacks as they await Sunday’s visit from the Baltimore Ravens. Of the two, rookie Lamar Jackson is the hot topic of the week in the Falcons’ locker room. 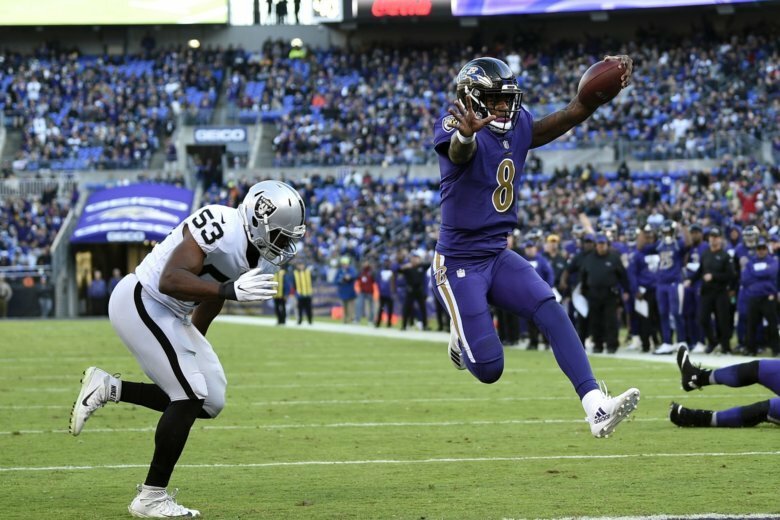 While the Ravens await the return of longtime starter Joe Flacco from a right hip injury, Jackson has boosted the team’s playoff hopes. The former Louisville standout and 2016 Heisman Trophy winner has led Baltimore (6-5) to back-to-back wins over Cincinnati and Oakland. Jackson suddenly is the team’s second-leading rusher after leading the Ravens to more than 400 total yards in each of the two straight wins. Even coach John Harbaugh is stunned by the impact of Jackson’s unusual speed in games. Jackson ran for 117 yards against the Bengals and 71 in last week’s 34-17 win over the Raiders . “It’s difficult to simulate, because he has such quickness and speed, like a wide receiver or a corner has, but he’s behind center,” said Falcons coach Dan Quinn. A priority for the Falcons this week is reviving a running attack which fell flat in last week’s 31-17 loss at New Orleans . Tevin Coleman and Ito Smith combined to net 6 yards on 12 carries. Judon has 4 ½ sacks in his last three games after getting only 1 ½ in his first eight games. Now in his third season out of Grand Valley State, he’s two sacks short of matching his career high. Baltimore’s bigger surprise is the emergence of undrafted rookie running back Gus Edwards, who has topped 100 yards rushing in two straight games. Jackson and Edwards have given the offense a new look — and opposing defenses new concerns. Baltimore owns the top-ranked defense in the NFL and is allowing only 18 points per game. Perhaps the most glaring flaw in the unit is the lack of takeaways. Terrell Suggs’ 43-yard fumble return in the fourth quarter against Oakland was only the Ravens’ eighth forced turnover of the season and first in four games.